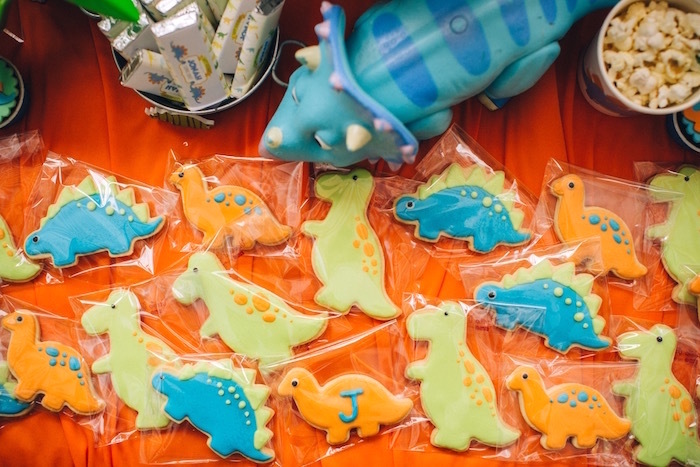 Looking for a dinosaur party as cute as can be? 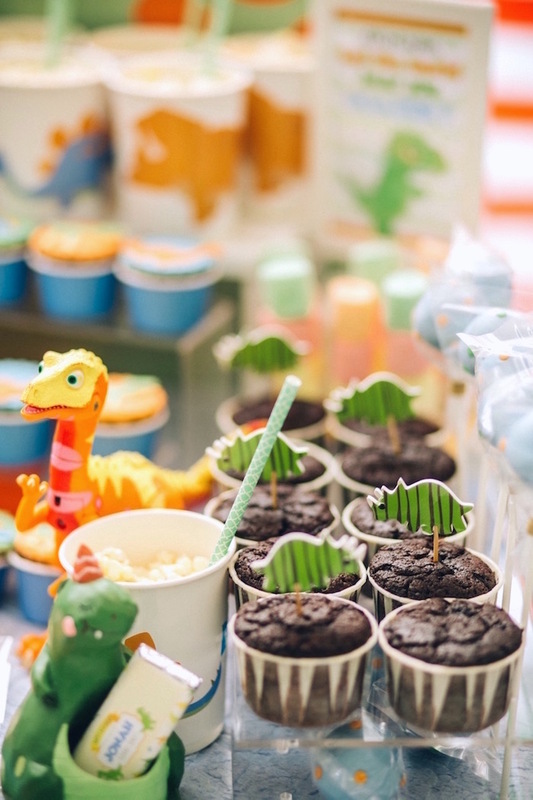 You’ll go crazy and extinct over this Modern Dinosaur Birthday Party; Yes-sir-ree! 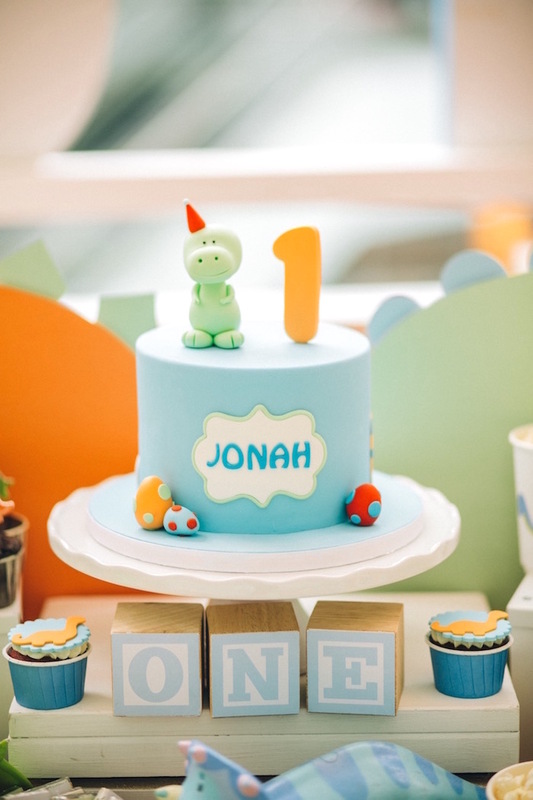 Submitted and styled by Pei Chyi Leong of Happy & Co out of Mont Kiara, Kuala Lumpur/Malaysia. 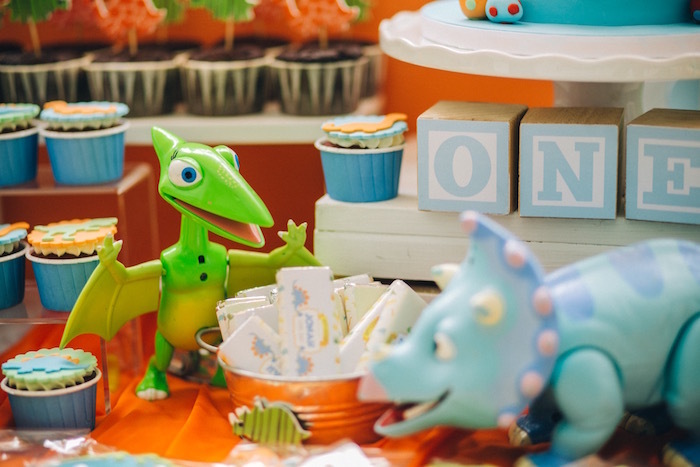 This prehistoric event will go down in the books! 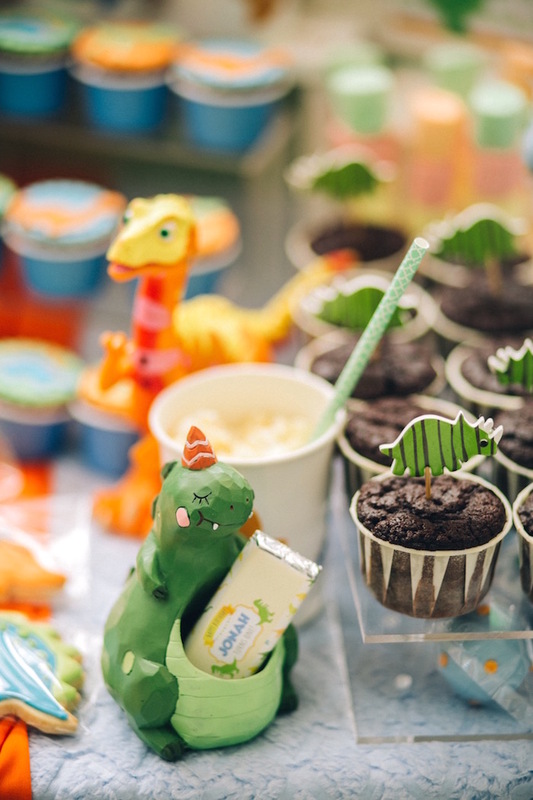 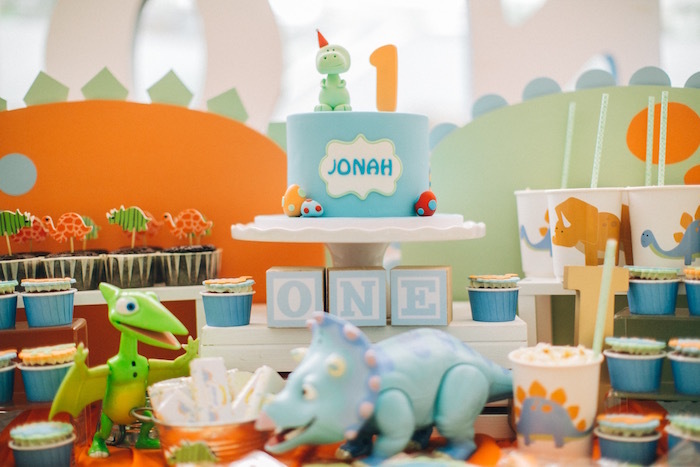 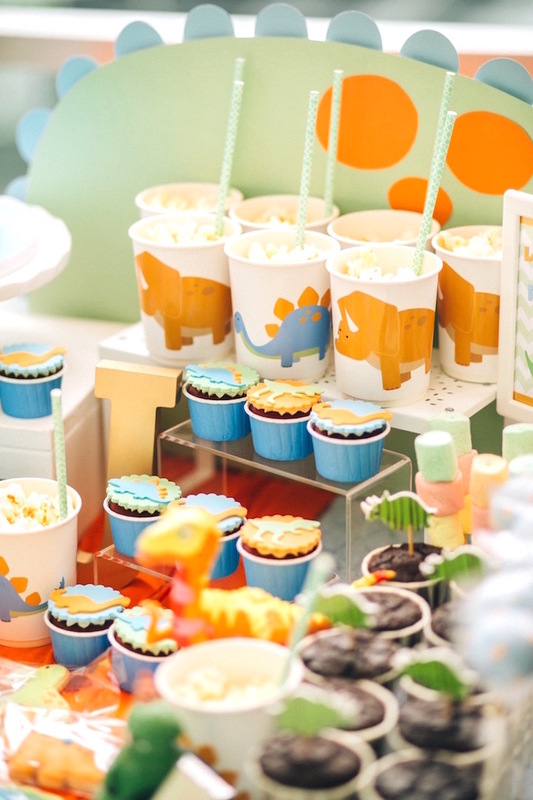 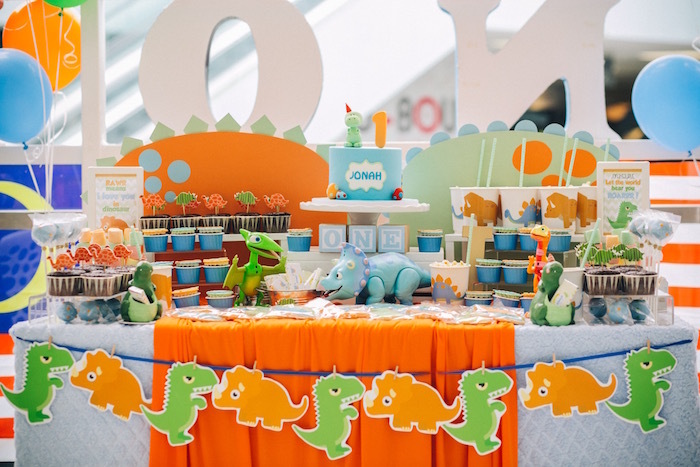 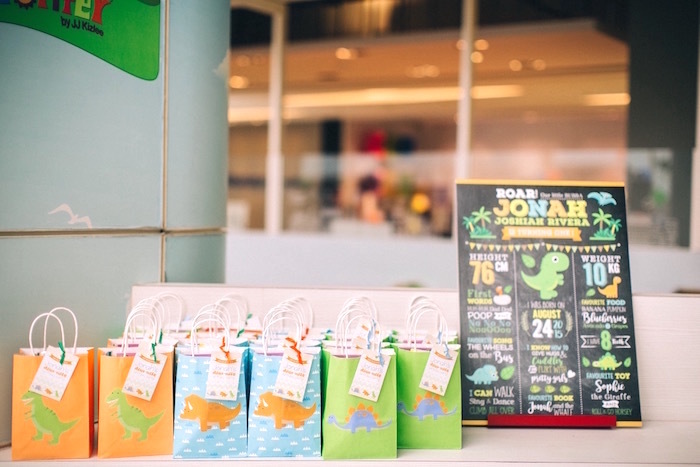 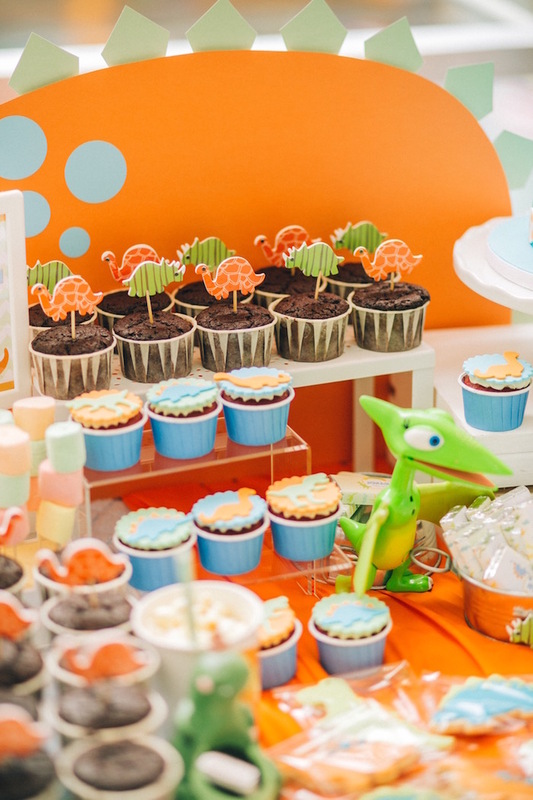 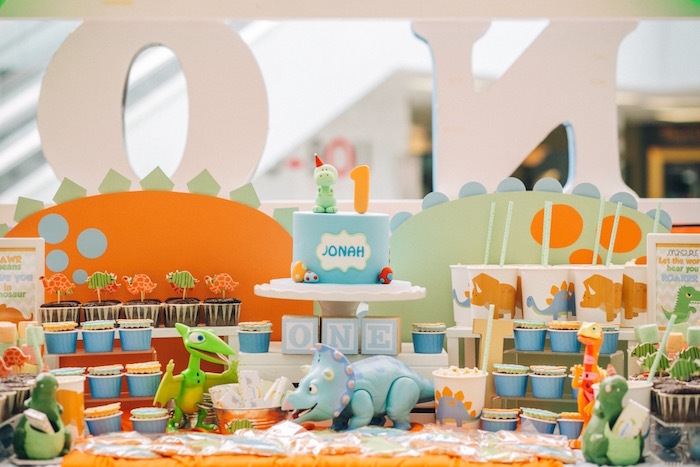 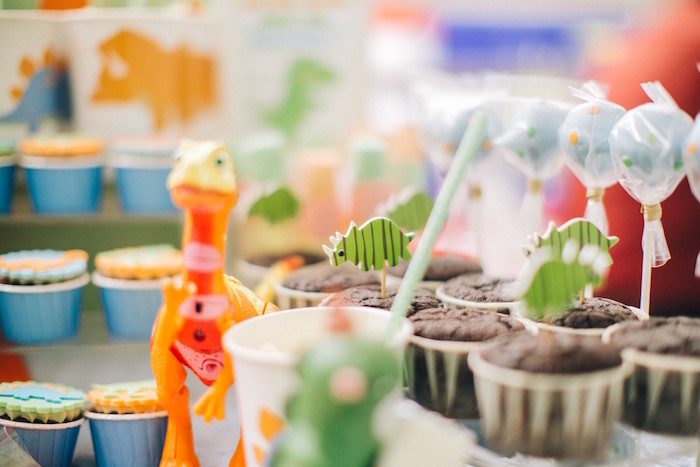 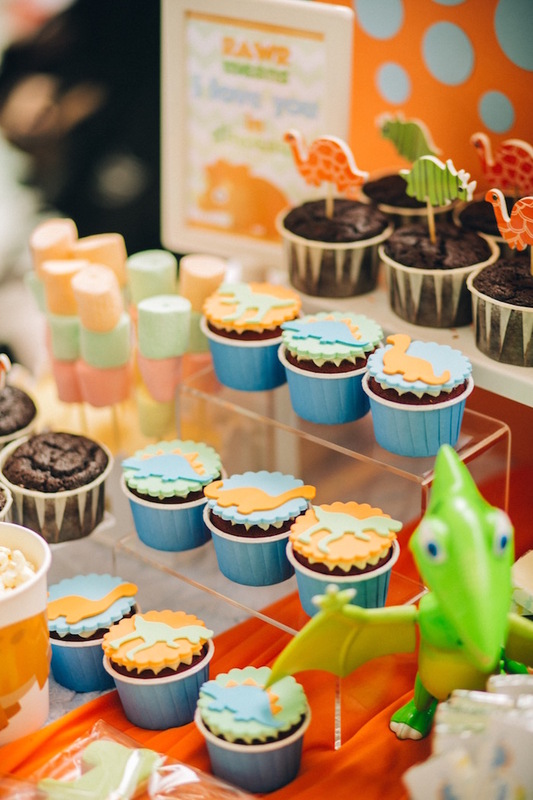 This is what Pei Chyi shared about the party- “We were tasked by our client to style a really fun party for her son who is turning 1, and the theme she had given us was simply cute dinosaurs, and i love orange and green. 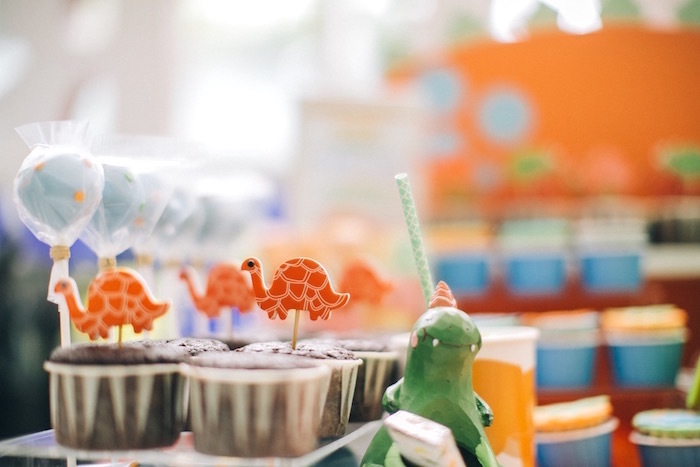 That was really, the shortest brief we ever got from our client! 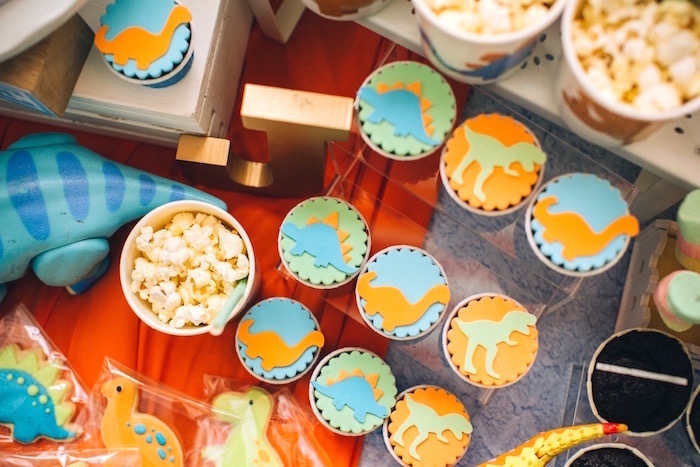 We went to work straight awayplaying with the idea of featuring cartoon-like dinosaurs in crazy unconventional colours. 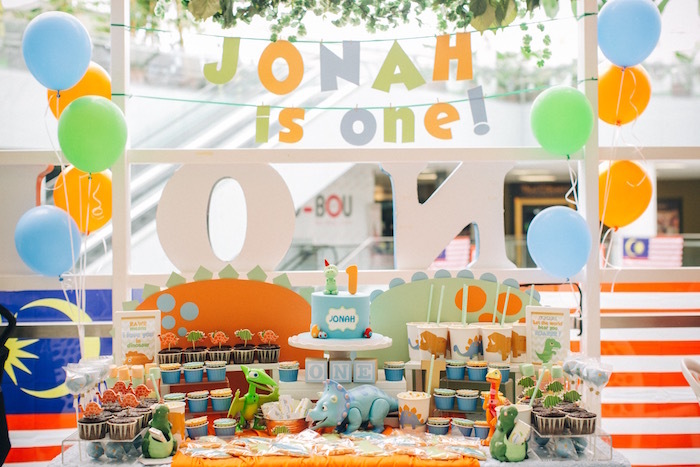 We kept the colour palette to orange and green with everything from the balloons to the dessert items and even the party favours. 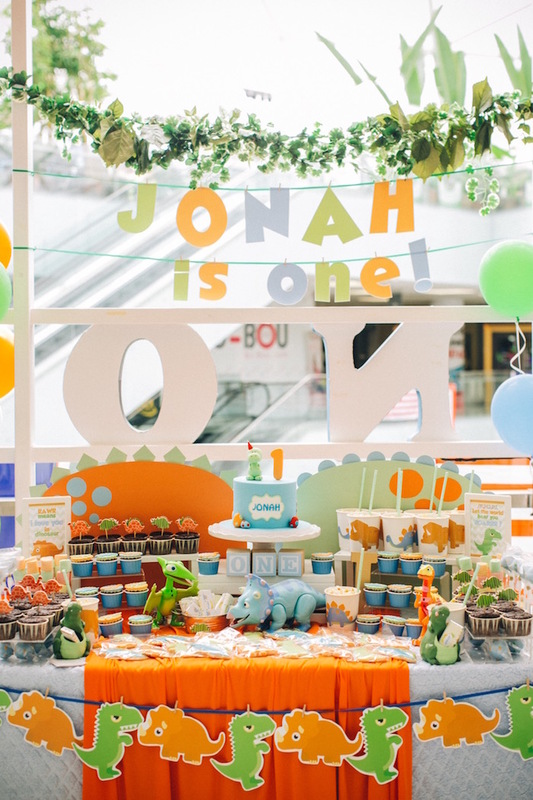 At first we thought orange and green was such an unconventional colour combination, but as soon as we put our ideas into our moodboard, boy of boy we were surprised how well it went together. 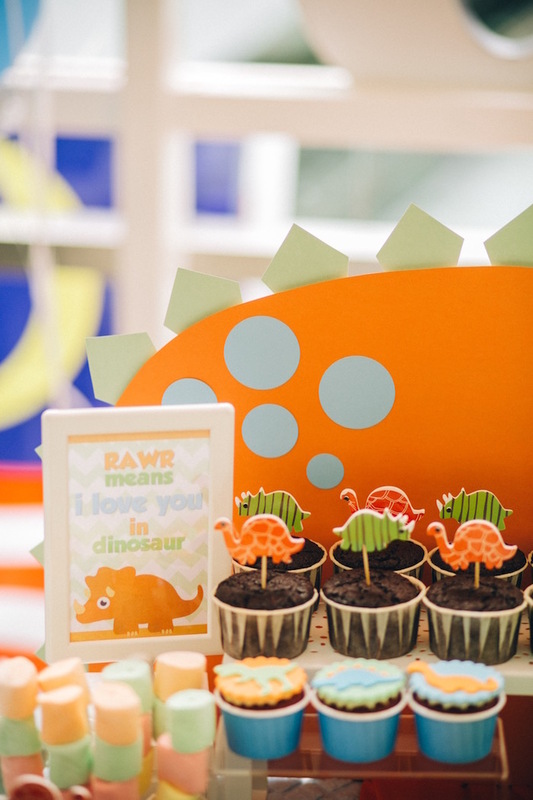 For the dessert table we created a backing that resembled a spiked dinosaur hump (think stegosaurus!). 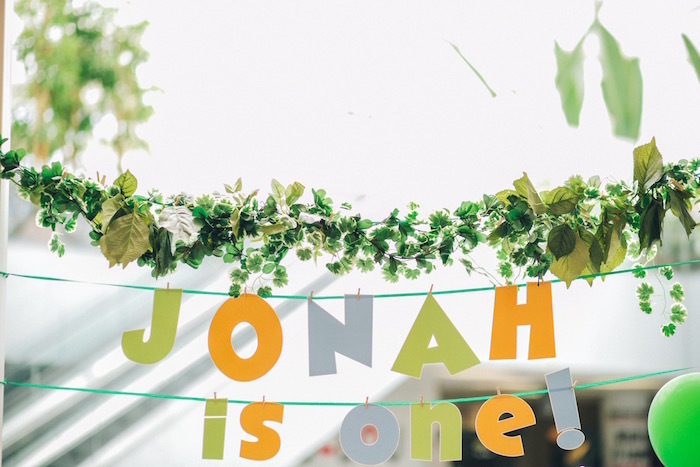 Our brief to our suppliers was to keep all the cupcakes, cookies AND the birthday cake relatively 2 toned and simplewe intentionally did this because the venue itself was already pretty colourful in nature. 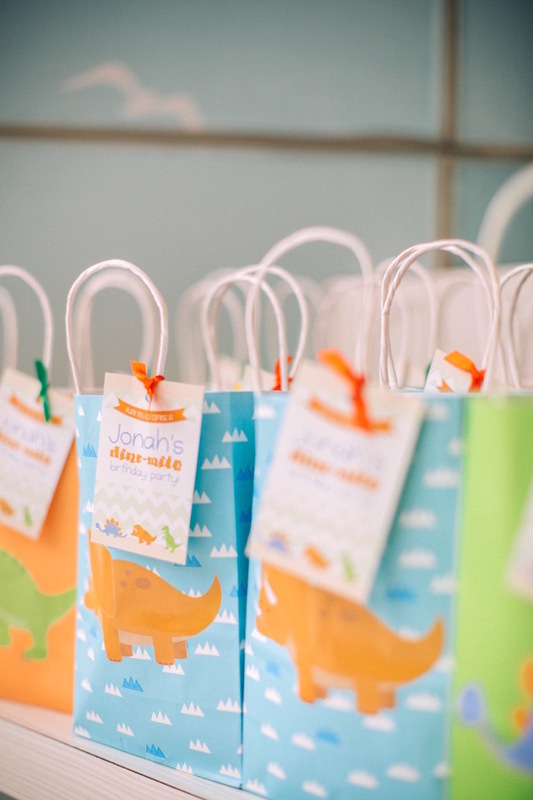 For the party favours, we customised paper bags in the theme colours with cut out stickers of dinosaurs and filled them with all things prehistoric. 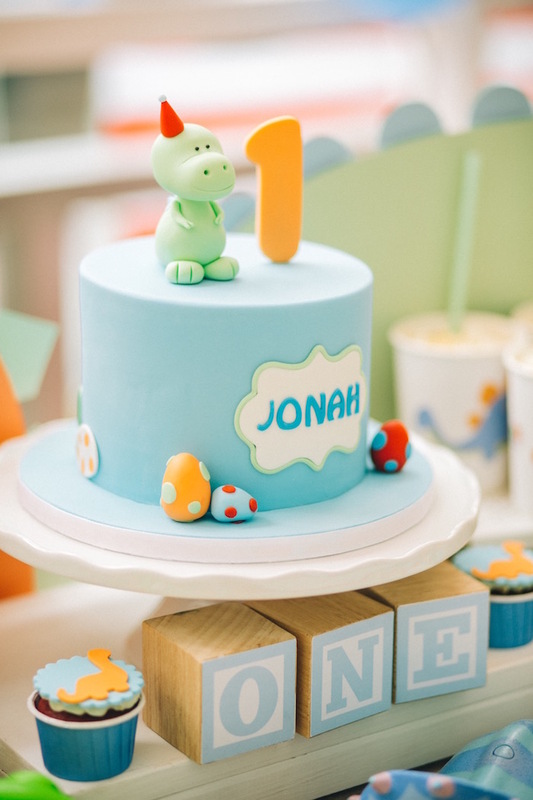 We just really wanted to keep the overall style cute and clean and to the theme! 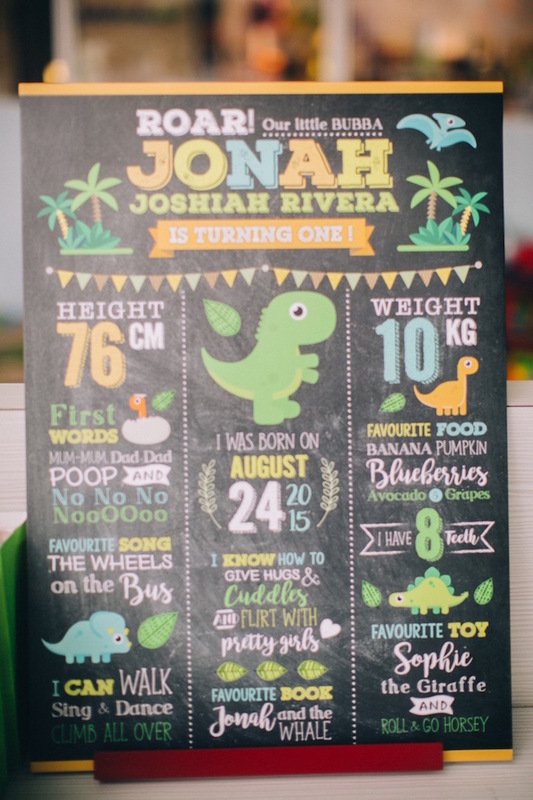 For first birthdays it is indeed a milestone for both parents and child, and we got our designers to put together a chalkboard milestone board that went perfectly with the theme.